Theo Paphitis picked out a Tees cheesecake-maker in his popular Small Business Sunday event. The former Dragons’ Den star selected Wynyard-based Rachael Whitehouse, who runs The Busy Whisk, in one of his weekly shout-outs on Twitter. She got to meet the multi-millionaire tycoon at the International Convention Centre in Birmingham – and said it was a “terrific day”. Rachael bravely gave up their teaching career four years ago – then in 2017 she attended her first farmers market at Wynyard Hall, along with her husband Bruce, and The Busy Whisk was born. “We now source our cheese from a local farm,” says Rachael. “We collect our cream direct from a local dairy (Embleton Hall). We even bake our own digestive biscuits that we use in the base of our cheesecake, and use locally-grown spelt that we collect straight from a farm that’s just a few miles from our home. Paphitis, who’s chairman of Ryman Stationery plus Boux Avenue lingerie and Robert Dyas, starred in the BBC2 Dragons’ Den programme between 2005 and 2012. He created Small Business Sunday, shortened to #SBS on Twitter, nearly 10 years ago. 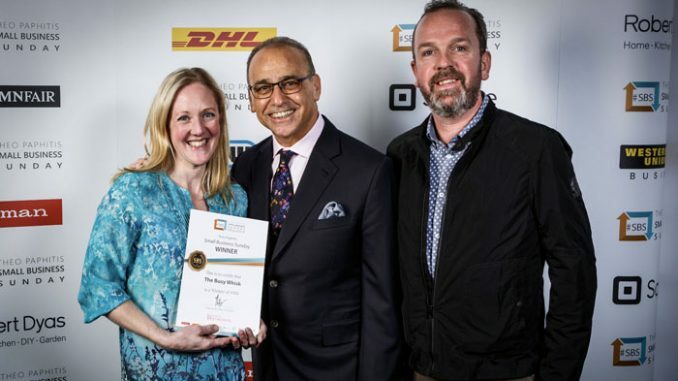 Each week, Paphitis rewards small businesses that tweet him @TheoPaphitis and describe their businesses in one Tweet, including the all-important hashtag #SBS, between 5-7.30pm each Sunday. “We were handpicked by Theo in October, he announced it on Twitter and our phones went crazy!” says Rachael. “The sheer amount of other small businesses that were congratulating us was overwhelming. “So we’re now part of a group of small businesses that love to encourage and help each other out. “Part of being part of SBS was an invitation to travel to Birmingham to receive our winners’ certificate and meet Theo. It was a day of networking and talks from big businesses and successful entrepreneurs. “I felt very special to be told that winning entries made up less than 1% of SBS applications. I came away feeling motivated and energised and it was a great way to start the year. “Theo seems to be a genuinely down to earth bloke who’s done very well for himself and wants to give something back. He wants help as many aspiring small business owners. “Setting up as business can be scary, there are often decisions to be made and we often don’t know the right thing to do. “He brings people together to offer advice and show that we’re not the first to go this path. Some of the advice we’ve received will help us immediately. We’re now looking forward to next years event already.